“This week (on the 17th and 18th July) we will be sharing poetry at Kunstefees in Free State Bloemfontein South Africa. I am looking forward to creating a memorable session teaming up with Riku Latti who is one of the great musicians that I'll be sharing words with. I"'m proud of you fellow poets. I wish you only success at Kunstefees. Enjoy. Hehehe...an awesome, winsome pair indeed; they continue to do wonders. 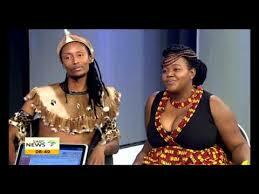 Well done Ntate Kuneke aka "kanga-man"
A lovely couple...in real life?